Ear piercing instrument commonly referred to as a piercing gun or an ear piercing gun is a device designed to pierce earlobes by driving a pointed starter earring through the lobe. 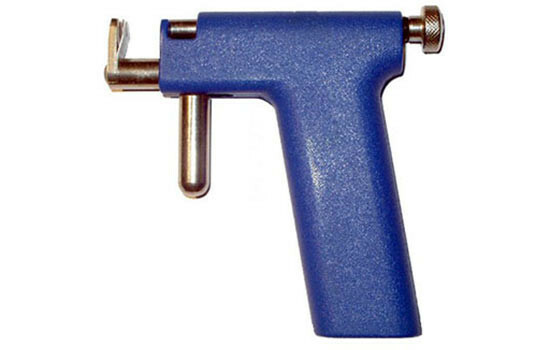 Piercing guns may be reusable or disposable. Piercing guns are typically used in mall jewelry shops. Piercing guns have been widely criticized as dangerous among professional . The use of older designs of piercing gun can possibly carry an increased risk of disease transmission, as compared to methods used by professional piercers. However, more modern designs of reusable piercing gun have addressed this problem by the use of self-contained disposable cartridges. With these new designs, all parts of the gun that could come into contact with the customer’s body are made of medical-grade plastic, which is sterilized at the time of manufacture and stored in sealed packaging that is only opened immediately before use in exactly the same way as the needles used by body piercing establishments. This automatically removes the problem of possible disease transmission found in the earlier types of device. Unfortunately there are still the issues of blunt force trauma to the skin and underlying tissue. Standard ear piercing studs are too short for some earlobes and most cartilage. Diminished air and blood circulation in tissue compressed by a piercing gun can lead to prolonged healing, minor complications and scarring.